If you have been keeping up with our blog, we have been giving you ways to revamp your home away from home. Having an RV that you love to be in, will make you want to get in and go more often. We want you to travel as much as possible in your stylish and comfortable RV, and pop by our RV Park in Louisiana, of course. Our RV park near Lafayette is the place for you to have some fun and relax at the same time! We have all the amenities you are after and have fun activities all year round! In this post, we are going to give you great ideas to fix up that RV of yours and take it from drab to fab! In your home, if you ever feel bored of a color on the walls, you can just paint right over, no problem. Who said you can’t do the same thing in your RV? One way you can break up the color scheme is by using some wallpaper or wainscoting. The wainscoting is a paneling that you can place on half of the RV. Create a rustic look with some dark maple wood paneling or a more streamlined look with white wainscoting. The material can open up the space and make it feel roomier. If wainscoting isn’t your forte, you can add some decorative wallpaper. You can decide to line all the walls within the RV with a more subtle wallpaper, or pick something bright or patterned for a fun and interesting accent wall. Having a unique space will make you want to spend more time in the RV while on road trips, or at our RV park in Louisiana. Finally, you can paint the walls just like you would your home. It is an easy fix for walls you don’t necessarily like, and it will change the whole look of your RV with a simple can of paint and color of your choice. If you are looking for some privacy when staying in your mobile home, curtains are a great way to add some style and get the secluded feel you are after. You can choose any type of material and pattern. Curtains will be able to help you create different moods within your RV. If you are wanting to feel the sunshine, open up those curtains. If you desire to get some shut eye or want to create a romantic mood, keep them shut tight. Curtains give your RV much more flexibility than it had before. One of the busiest places within your RV is your kitchen area. This area of the RV is important for making meals, getting drinks, and is a great place to stand and congregate when you are at a stop. Because the kitchen gets so much traffic, ripping out an old floor and replacing it with something more durable and more in style, with the aesthetic you are going for, is a great idea. If you are deciding to do an overhaul on your RV, you might as well change up the whole floor while you are at it. You can do vinyl throughout the entire RV to give it a very cohesive look, or you can do another material suitable for your RV. You may even want to consider carpet, so that you can have another lounging space if needed. Hopefully, all these tips will help you revamp your RV and make it the home on wheels you have always dreamed of. At Frog City RV Park, we want you to always have a great time in a great space. Sprucing up your RV will make you and your family very happy, on any type of road trip. If you are dying to get into your RV and out on the road, come see us in Louisiana. Enjoy the sunshine, laughter, and of course, fun. 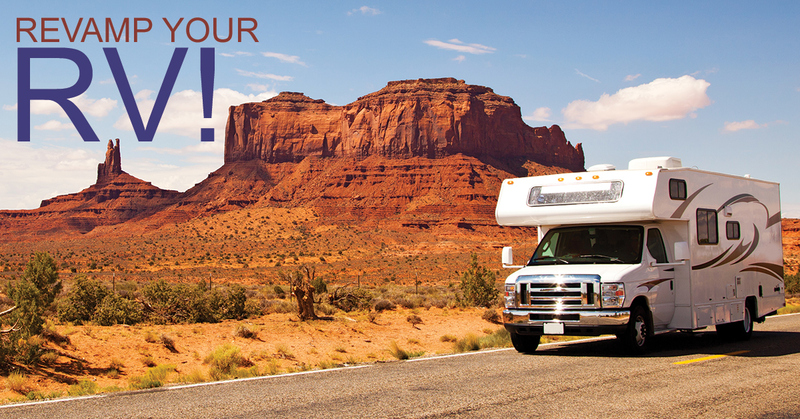 Check back for our next blog where we go over some renovations that are necessary for your RV.